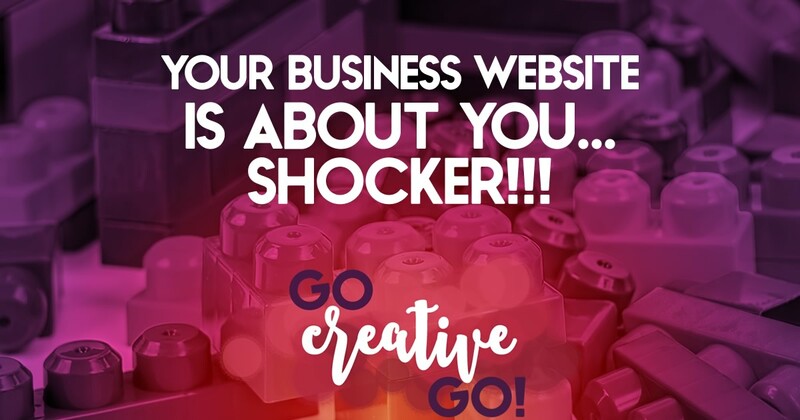 SHOCKER: Your Business Website IS About YOU! Do a quick hashtag search, on Twitter, for #webdesign and you’ll see quite a few article links, portfolio links, questions for designers, calls for designer recommendations, and a lot more. You’ll also see many a blanket statement discussing for whom, exactly, a given website is designed. Almost daily I see another blog post about web design being all about your audience. I disagree with that statement and that’s what I’m going to dive into in this read. People do business with companies/brands they know, like and trust. If a site is all about the consumer viewing it, and not at all about the people and personalities behind the company, how the heck is any consumer going to deem that company likeable and trustworthy? If science fiction movies have taught us anything, it’s that robots, more often than not, can’t be trusted. If a blog is part of your web design plan, you’ve probably spent some time researching that topic, too. And you’ve probably come across the USP. Concept. USP stands for “unique selling proposition.” The concept requires the site owner or content marketer to consider this question. What makes you stand out from the rest of the content marketing crowd? Your unique voice and your brand’s personality, of course! But, without plenty of Y-O-U in your website, it’s going to be hard to showcase your unique voice. Consider this. You’re going to be spending a LOT of time in and around your website as you continue to market your products and/or services to your targeted audience. You’ll be crafting killer content and the branded featured images that go along with it. You’ll be sharing pages, posts, embedded graphics and more across social channels. Your website is your digital office space. If you don’t like the vibe, don’t enjoy spending time in the space, it’s going to be very hard for you to put in the proper time and effort. I’m know I’m less productive in a space that I don’t enjoy. Can you get excited about creating opt-ins and savvy sales pages when you don’t like the digital home on which these elements will reside? It’s certainly something to consider. Of Course You Must Consider Your Customer! I’m not saying, for even a second, that you shouldn’t keep your ideal customer in mind when you’re planning your website. Of course you must create an experience that suits the needs and drives the purpose of your prospects. But those prospects want to do business with your brand, your company, your people, your culture. Not with your website. Yes, your website is a tool that allows your prospects to more carefully consider your value to them. If there’s none of you in that site, how are they supposed to get a feel for the culture you’ve created? They can’t. Generic sites create generic experiences. Sites with designed with the vigor, vitality and voice of a “brandtastic” brand will draw them in, then the smart functionality will allow for the easy transaction. I’m a big believer in balance. When we balance the needs of all involved in any project we have a much better chance of reaching an outcome that suits the majority rather then a small minority. The same goes for your website and your online presence. If the real you can’t shine through, in a smart and professional way, it’s going to be hard going to make the effort to effectively market that presence. Love for our business and the brands we’ve built is a big part of the entrepreneur experience. Your website plays a huge role in that love affair. So you’ve gotta love that website. And that means that website is absolutely about Y-O-U! http://www.gocreativego.com/wp-content/uploads/2015/07/GCG-pinnable-shocker-site.jpg 1080 735 Mallie Hart http://www.gocreativego.com/wp-content/uploads/2016/07/GCG-sitelogo-new.png Mallie Hart2015-07-20 08:15:102016-10-07 16:06:07SHOCKER: Your Business Website IS About YOU!